Mr. Zia-Ul-Mustafa, FCMA has exposure of over twenty years in corporate and public sector organizations during which period he remained associated in various segments of economy like manufacturing, construction, services, banking and education. Presently; he is serving as Chief Financial Officer & Business Administrator of Pakistan Expo Centres Private Limited, a corporate entity owned by the Government of Pakistan with a mandate to develop, operate and promote Expo Centres in major cities of Pakistan. He is performing duties in this company since its inception in 2005 and as its leading team member, he has played a vital role in developing projects feasibilities; projects financing, projects execution, organizational management and launch of successful business operations of Expo Centres. He has put his best efforts to convert the idea of developing and managing of expo centres into reality on self-sustain basis. In recognition of his services, he received award from the Prime Minister of Pakistan. Earlier, he had worked with Descon Engineering Limited as Financial Controller of Mangla Dam Raising Project & Mirani Dam Project and with Rustam Group of Industries as GM Finance & Administration. He also served as elected Board Member of Pakistan Institute of Corporate Governance (PICG) for three years and as Member Board of Directors of Zarai Taraqiati Bank Limited with additional responsibility of Chairman, Board Audit Committee for a period of three years. Apart from having corporate and professional experience; he has the exposure of travelling to over 20 countries and he also enjoys good reputation as corporate trainer. Mr. Zia ul Mustafa who served ICMA Pakistan in various capacities has also ample exposure of SAFA, CAPA and IFAC. During the period 2012-14; he assumed the responsibility of President of ICMA Pakistan with distinction of being its youngest President since inception of Institute in 1951 by attaining this position at the age of only 37 years. 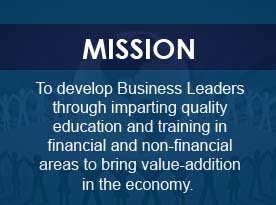 As President, he took various initiatives with the support of his team; major includes launch of first ever focused study material for ICMA students and computer based examination, publication of 10 research books; acquired webinar technology; organized average 1800 credit hours program per annum; enhanced mutual recognition with international accounting bodies; establishment of Cost Accounting standards Board and launch of first ever cost accounting standards from the Institute; formed Quality Assurance Board to improve members practice; got approval for computerized and overseas voting from Ministry of Finance; got approval from the Government for the new title of members i.e. 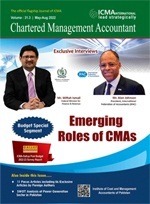 Chartered Management Accountants; got right for CMA’s to become the Member of Income Tax Appellate Tribunal; approval from SECP for Directors Training Programs; establishment of technical directorate; formed overseas branches; infrastructure developments at all centres of ICMA and generation of unprecedented surplus of Rs.329 million during that period. He is known for his initiatives taken for the accountants’ community especially for Management Accountants. In recognition of such achievements under his leadership; ICMA Pakistan received the FPCCI Best Achievement Award from the President of Pakistan in the year 2014.